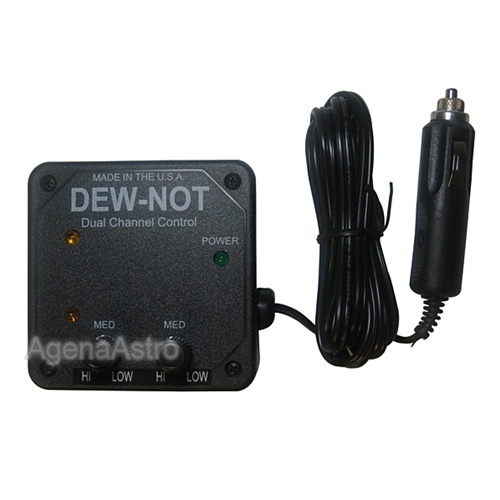 Introducing Dew-Not's NEW Dual Channel Controller! Do you want to power several Dew-Not strips from a single power source? Or exercise finer control over the power output of Dew-Not strips? Then the Dual Channel Controller is what you need. The new DNC02 is a microprocessor-based dual channel controller. Each channel controls two outputs for a total of four outputs (these can be increased using a DNS splitter (sold separately). Each channel can be controlled to provide an output ranging from 0% to 100%. Best results are normally achieved with an initial setting between medium and high. The DNC02 is manufactured for operation on 12 volts DC. Total amperage capacity for all four outputs is 10 amps. The controller is supplied with a six foot cord equipped with a cigarette lighter plug end. A 10 amp fuse is incorporated into the plug. The controller features a UL 94V0 enclosure and is virtually RFI free. Velcro is provided for attachment. Power cord length is 66". 1 year limited manufacturers warranty. 4.7 (Based on 6 Reviews) 100% of reviewers recommended this product. The Controller work well and was definitely a good purchase on my part. Easy to use and works well ! Review by Zakie of Israel. Review by Ponchos of Saskatchewan, Canada. 5.0 Quaity Unit, very happy! First off, before I purchased this unit I had a question about it, so I emailed the person in charge from Dew-Not's website. It was a weekend and I didn't expect an answer for a few days. To my surprise I got a reply/answer in about an hour. He also welcomed additional questions if I had any. Talk about great service!!! After buying this unit I could not be happier with it. Like their other products it appears excellent quality and is easy to work. I should add that one of my concerns was that it only has two control knobs each running two lines. I thought I may prefer having one knob for each line. After using this many times now I see that 2 knobs is just fine and in fact makes things easier working in the dark. I simply don't need to control each line seperately. Review by ALS of Russia, Irkutsk region. Review by Porkchop of Wisconsin. 5.0 Dew Free so you can See! I looked around for a while for a dew heater and eventually bought this one. I have to say I am very happy with it. Its small (about 3x3 inches) and built like a tank! The 4 outputs are nice, I have a 10" Dob and run a Telrad Dew Heater, one for the EP, and one on each end of my 9x50 finder scope. Since I've been using this setup, I have had Zero dew or fogging up problems. I totally recommend it!